I buy the flours in large quantities as I bake a few loaves a week. This is a really tasty bread. And very more-ish. Once you have one slice, you won't be able to stop. 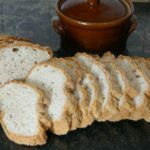 It's also lighter and softer that most other gluten free breads and doesn't get stuck on your palate like some of the manufactured ones on the market. Put all your dry ingredients into a mixing bowl and gently mix them until combined. Don't be tempted to whisk them or you'll end up with flour flying round your kitchen. This will include egg white powder. 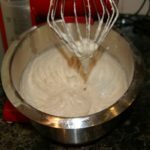 If using fresh egg whites, then add those to the wet ingredients. Next, beat fresh egg whites if using just to break down the gloopiness. You don't have to beat them into meringues. Stir in the oil and a little of the water. Add this mixture to the flour and put your food mixer on to a slow whisk. Gradually add the rest of the water until the mixture resembles the consistency of Mashed Potato or Cake Batter. Pour the mixture into a 2lb loaf tin. I used a Plait shaped tin to give the rustic shape. Cover with some cling film or clean tea towel and put somewhere warm for approx 30 minutes. Until the dough has puffed up nicely. Don't be tempted to leave until double in size, or you'll end up with the whole loaf collapsing in the oven or getting very large holes inside. It only needs to rise about a third more. It will rise some more in the oven. Leave in the tin for 10 minutes before turning out to cool. Don't try to slice the hot loaf, it won't cut properly. Sprinkle a bit of buckwheat flour over it to give the rustic look. Tip: If you cut into it and it's sticky when cool, then put back into an oven for another 15 minutes or so. If you over cook it, it may become a bit dry. 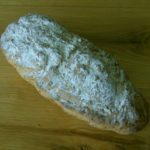 This is a delicious tasting loaf and has a great texture. It also toasts really well. Would also make a lovely Garlic Bread accompaniment to a meal, spread with garlic butter and put under a hot grill. If, when it's cooled down, it's a bit on the sticky side, then it will need cooking a little longer. Give it another 15 minutes in a preheated oven. This is also great if you have a corn allergy or intolerance. 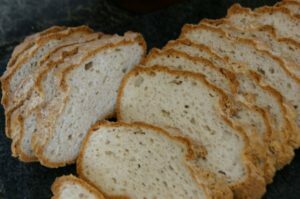 Most gluten free breads on the market contain cornflour, so it's really difficult to find any corn free loaves.